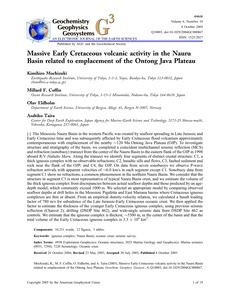 The Mesozoic Nauru Basin in the western Pacific was created by seafloor spreading in Late Jurassic and Early Cretaceous time and was subsequently affected by Early Cretaceous flood volcanism approximately contemporaneous with emplacement of the nearby бн120 Ma Ontong Java Plateau (OJP). To investigate structure and stratigraphy of the basin, we completed a coincident multichannel seismic reflection (MCS) and refraction (sonobuoy) transect from the center of the Nauru Basin to the eastern flank of the OJP in 1998 aboard R/V Hakuho Maru. Along the transect we identify four segments of distinct crustal structure: C1, a thick igneous complex with no observable refractions; C2, basaltic sills and flows, C3, faulted sediment and rock near the flank of the OJP; and C4, the OJP. On data from seven sonobuoys we observe P-wave refraction arrivals with apparent velocities of бн6.0 km/s in each segment except C1. Sonobuoy data from segment C1 show no refractions, a common phenomenon in the northern Nauru Basin. We consider that the structure in segment C1 is most representative of typical Nauru Basin crust, and we estimate the volume of the thick igneous complex from discrepancies between actual seafloor depths and those predicted by an age-depth model, which commonly exceed 1000 m. We selected an appropriate model by comparing observed seafloor depths at drill holes in the Mesozoic Pigafetta and East Mariana basins where Cretaceous igneous complexes are thin or absent. From an empirical density-velocity relation, we calculated a basalt loading factor of 780 m/s for subsidence of the Late Jurassic-Early Cretaceous oceanic crust. We then applied the factor to estimate the thickness of the younger Early Cretaceous igneous complex, using previous seismic reflection (Charcot 2), drilling (DSDP Site 462), and wide-angle seismic data from DSDP Site 462 as controls. We estimate that the igneous complex is thickest, бн5500 m, in the center of the basin and that the total volume of the Early Cretaceous igneous complex is 3.3 б┐ 106 km3.